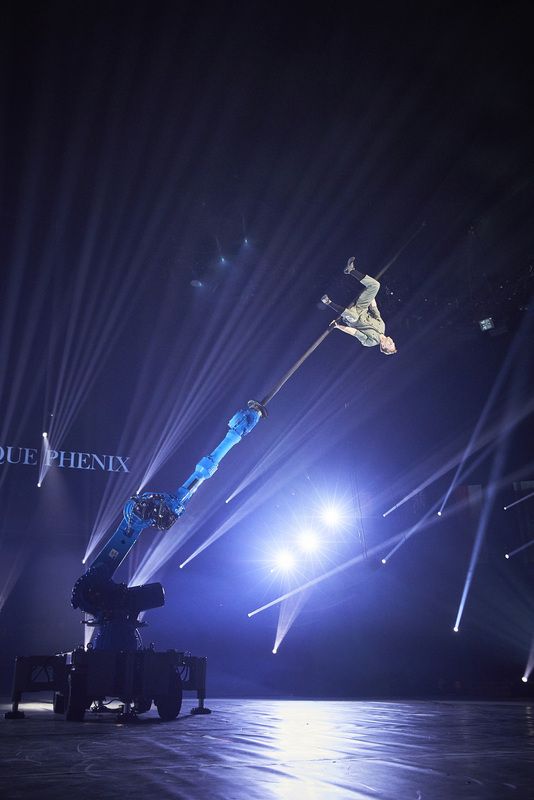 In Paris this past January, at the Festival Mondial du Cirque de Demain, a giant robot took center stage and began an intricate duo act with a man. Although it was completely novel, it felt slightly familiar too, because the robot, known as RoboPole, was, in fact, an equal partner in the routine, and as such had a character. Since the beginning of time, humans have been ascribing human characteristics to animals, puppets and also every machine they have made–its our own special God complex, so of course circus is no exception. Watching the human/robot the relationship play out, seeing the immense power of many tons of steel as it navigated space with its human partner, Martin Riedel, was something to behold, thanks also to Joanna Bassi, director of choreography for helping that magic unfold. In fact, it may be something many of us behold more of in the future, as tech becomes more integrated into to our daily lives, artists are more apt to embrace it as a tool. 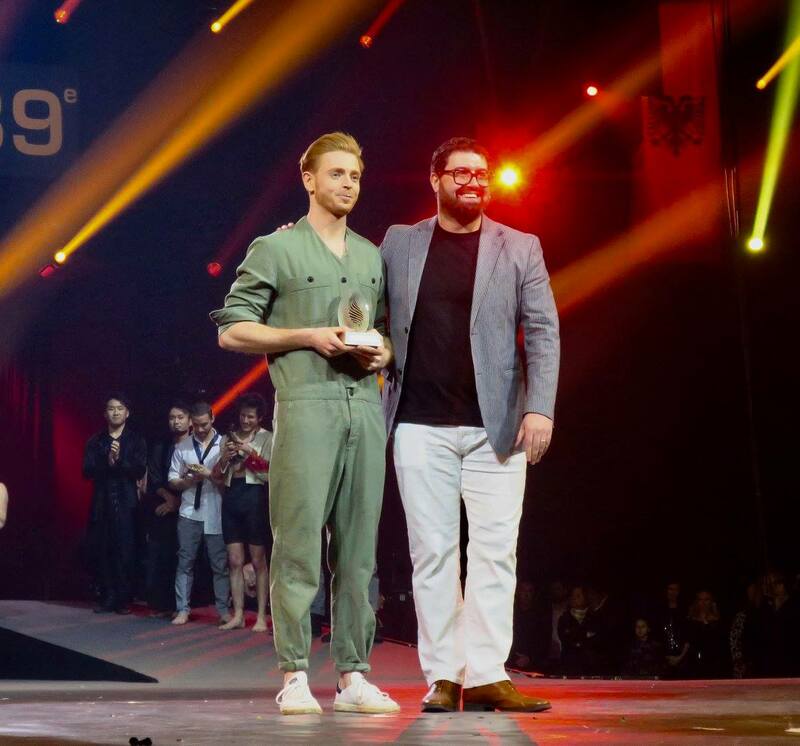 The act was awarded the Cirque Du Soleil Performance and Artistic Innovative Vision trophy, and Martin and UliK have since gone on to develop a full show with the encouragement of the circus industry. We had the pleasure to talk to the circus artist Martin Riedel as well as the hidden human behind the robot, UliK about their work with RoboPole and the concept of robotics in the arts. Kim Campbell: Tell us a little about your background as a circus artist? What was your specialty at school? What other types of circus shows and work have you done before working with RoboPole? Martin Riedel:I graduated with a diagonal Chinese pole act from ACaPA in Tilburg – the Netherlands, in 2014. Inspired by Roberto Magro, during a creation with my class in the 3rd year of circus school, I started researching material on a diagonal Chinese Pole and focused on new stage architecture, despite the regular pole. Before RoboPole, my main focus was on entering the German Varieté market, performing shows in GOP, Palazzo, Galas and a few corporate gigs. Unsatisfied, I was always looking for a more challenging, and most importantly– a more artistic project. Together with Mathias Ramfelt, I got pre-selected for Circus Next in the year 2015. We did not get further but had crazy times (farting) on stage. I still enjoy the concept and will continue working on this production in the future. In the same year, I met UliK via the Rudi Renner Agency at the “Internationale Kulturbörse” in Freiburg, Germany. Scott Nelson from the Accidental illusionists “Scott & Muriel” introduced me to him and two weeks later UliK and I ended up in his crazy secret inventor workshop, trying out his robot and the first of many Chinese poles. The poles used to break and took a long time and resources to figure the right materials. A dystopia could be that humans have to perform for robots, like the lions and elephants did for humans. Imagine a theatre where robots sit and observe human acrobats for their entertainment. KC: What interests you about working with a robot and how is it different or similar to working with a human partner? MR: What I find interesting is definitely the indefinite options and possibilities of the apparatus in space and the new physical challenges that come with it. I love it! There is too much to say to fully answer that question. I am currently writing a book “Machine Human Interaction” that should give more insight into the topic. But, in a nutshell: who would not like to work with a robot living in these present times? The main difference. A robot has no emotions and executes purely and sometimes brutally in the way it got programmed. A human partner reacts and has emotions. It changed me as a person and the way I look at life. For example, I’m thinking about optimizing any process, including all my behaviour in daily life and I see hairdressers and taxi drivers being replaced by robots, before I will retire. Sometimes it feels like looking in to the future, knowing what will happen. KC: Do you feel as if the robot is a separate entity from its operator, Ulik? MR: Yes and no. It is a data processing machine, that does what you tell it. UliK tells the machine what to do, so it is a prolongation of his thoughts. At the same time, I ask UliK for certain adaptations, on how I need positions and moves to be. That is my choice, interpreted by UliK, executed by the robot. So far UliK is the only programmer I worked with and therefore I can not compare it to another operator. 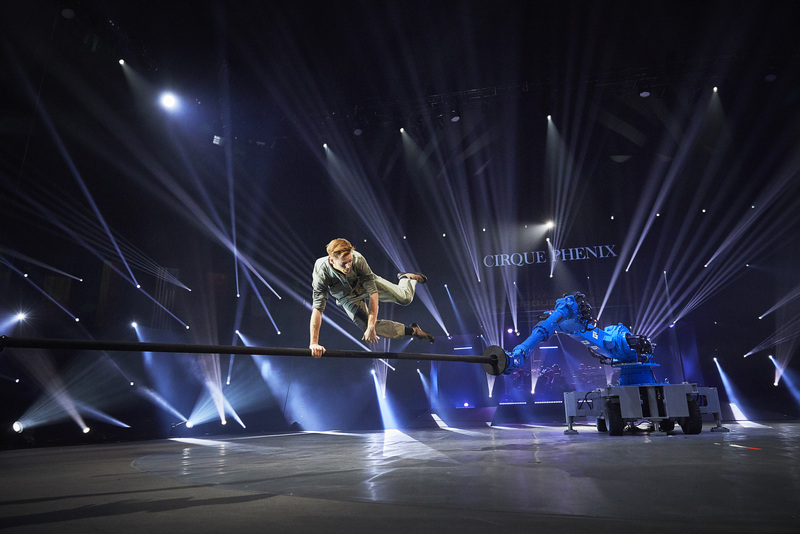 KC: How do you think technologies like this might affect the future of circus? MR: I need to refer to the wait for the book answer again. Circus is in a permanent flux and I am happy about it. Modern machines and inventions were and are always part of the evolution of circus, so will be robots. In 10 years it will be what smartphones are for us now. We will see robots performing with robots. It will open new fields in circus and it will change the whole field. At the same time, we will always be able to see the previous forms of circus, since it is a parallel evolution. A dystopia could be that humans have to perform for robots, like the lions and elephants did for humans. Imagine a theatre where robots sit and observe human acrobats for their entertainment. KC: What is a challenge that arises from working with a robot pole rather than a stationary one? KC: What kind of feedback do you get from audiences about your performance? MR: The audience would like to see more. They have problems understanding the machine and some want to know how it works. “Is it programmed?” The interest lies in the robot and not the performer. But the human factor in the show creates the reference for the audience, to identify themselves with the whole concept. Some see an interaction with the robot and interpret a character into it. When this happens, the machine comes to life. The robot is as exotic as the elephant was in the past. UliK manages with all his concepts to awaken curiosity in the spectator and that the audience is truly astonished. KC: Could you develop this act in to a full show? If so, what themes would you want to explore? MR: We have just done this, and we will premiere the full show at the Tollwood Festival in 27th, 28th, and 29th of June in Munich – Germany. The recent working title for the complete show is: “RoboCircus”. RoboPole will also be at the Docklands Festival in Greenwich at the 23 and 24. of June. What we explored is a deeper connection and conflict with the machine and how it can speak for itself, as well as how we can communicate with it. This topic is endless, and we just scratched on the surface. KC: How has life changed for you as an artist since winning the award at Demain? MR: The award and the festival gave us a good lift and we are very thankful for all the support. My life did not take a turn. I had to realize that I need to work even harder and that my calendar is getting full faster. RoboPole changed me and it taxed me in many ways. For some of the changes I am thankful, but I had to realize that working with a machine turned me into a machine, too. It is important for me to remain human, but to be able to work sufficiently with this project I’m only allowed to process and execute information. The human factor maintains on stage since the audience identifies with me. Personally, I am focusing on empathy and keeping flaws that make me human. For me, the complete project is a piece of art. KC: Tell us about your background. How did you get your start in the arts? 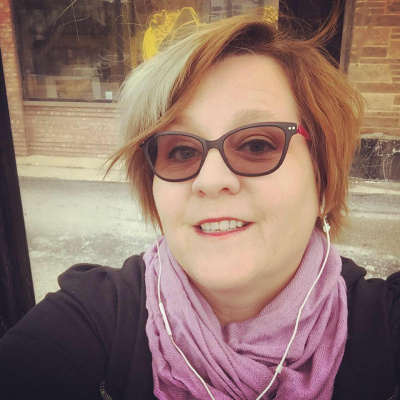 U: I was born in 1965 as a native of Bavaria, became a trained master upholsterer and already made first experiences with street theatre as a teenager. In Munich, I started as a stage designer, then as a participant in my first own theatre production “Der Musenkuss”, after that many years of successful touring throughout Europe followed. For several decades, I have been creating shows around crazy machines and brought robots to life on international stages and festivals. KC: How did your fascination with robotics begin? U: My fascination with machines led me to create a show with a borrowed industrial robot in the early 2000s. A robot that was previously programmed in a factory to process car parts received a second “career” as a part in one of my shows. I couldn’t let go of this idea until I finally bought my own robot in 2013. For the anniversary edition of the Tête-à-Tête Festival in Rastatt, I rebuilt the robot and created an Adagio act with two artists. After the successful premiere in May 2014, I continued to work on the concept: to realize artistically demanding shows, around and with the robot, according to the plug-and-play principle. With various attachments for the robot arm (a platform, a Chinese pole and a giant drum) the robot becomes both a backdrop and a 360 degree prop and, due to the perfectly programmed movements, an almost human-looking actor. With this potential the robot offers countless possibilities for new show concepts. Now I own a second robot, which was an integral part of a show in the Wintergarten-Varieté Berlin from July 2017 to February 2018. KC:Did it take a lot of training to become the operator and to program RoboPole? U: The most important thing when working with the robot is safe handling and detailed knowledge for programming the individual show sections. I did a special training at Yaskawa – the robot manufacturer – and subsequently deepened and refined my programming experience over the last 5 years. KC: What types of performances does RoboPole do? U: We are not only talking about the RoboPole show but also about two other existing show concepts that combine street theater with high artistic skills. I also use the robot for special customer requests such as congress openings with the big drum, the handing over of a foundation stone at official ceremonies or any other special inquiry. In such cases, the robot is programmed on site to the special conditions and requirements of the customer. In addition, the robot develops a life of its own in the course of the game, so that the spectators perceive it as an independent actor. This takes artistry and circus to a new level. KC: I’ve heard you say that as the robot operator, you are in a sense a partner to Martin too. How did you two devise an act together? U: Working on a show, in which man and machine act together, means great trust between the artist and the operator of the robot. Martin and I have been working together for four years now, we have not only developed the show together, but also worked on the pole in such a way that it is suitable for the special situation and requirement. This didn’t work from the beginning, during one of the first try-outs the pole broke and we had to start from the beginning. The current result of the show is based on ever new adaptations and ideas, it is a constant process of learning and developing. KC: What are some other uses you can imagine RoboPole having in the circus world? U: Once again, we are talking about UliK Robotik as an overall concept, the RoboPole Show is part of it. We are currently working on a new version that combines all three show elements into a 45 – 50 minutes show that can go on tour at international festivals. KC: What do you find interesting about RoboPole? U: The fascination in working with the robot is based on the precise control and the fact of overcoming the physical limits of the human body and bringing man & machine into harmony at work. In addition, the robot develops a life of its own in the course of the game, so that the spectators perceive it as an independent actor. This takes artistry and circus to a new level. KC: Have you considered other technological collaborations in the circus industry? U: We already worked for Dragone in Dubai and for Wintergarten Varieté in Berlin. 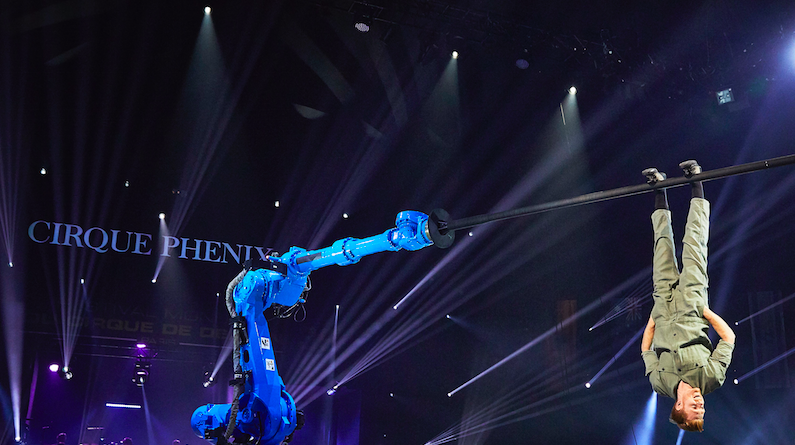 Furthermore, we are in contact with different circus partners like FlicFlac, Roncalli, and Cirque du Soleil, who are interested in integrating the robot into their show, either with an existing show or for new concepts. New technologies will be considered and we are permanently working on new ideas and future developments.